Editor’s Note: Review revised in order to be as factually correct as possible. When gamers hear the title Secret of Mana, a wealth of emotions and memories come flooding back to them. Stories about saving the world, a legendary sword, awesome gameplay, a vibrant world to explore, and that renowned soundtrack are what often come to the minds of players whom have had the pleasure of experiencing this game. It was an instant classic at its debut and still manages to outshine its contemporaries. Clearly Koichi Ishii and his team managed to produce something so extraordinary that it not only resulted in everlasting praise by its fanbase, but it earned the legendary prestige the Mana series is now judged by. 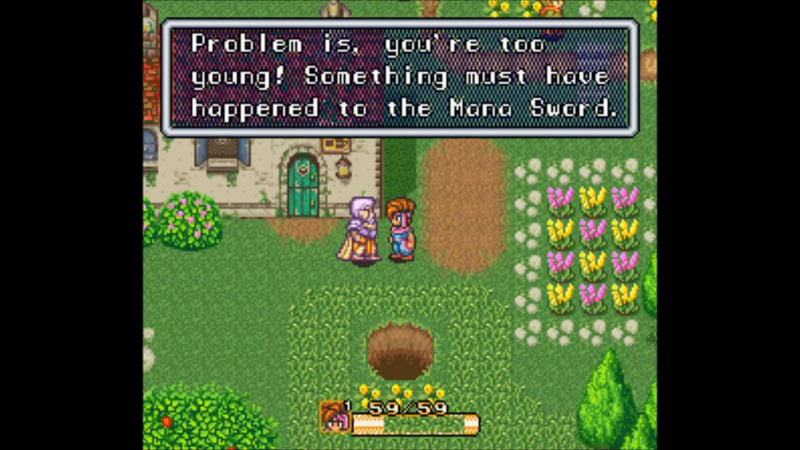 Secret of Mana is the game that sets the standards for the series, introducing the iconic Mana styles that permeate the sights, sounds, and tales within each game. 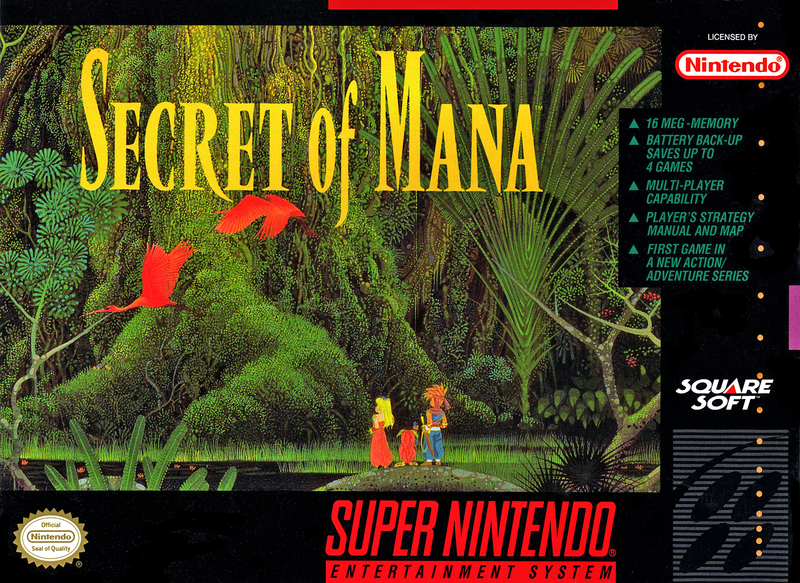 For the uninitiated, Secret of Mana is the first genuine success in a line of Mana games that tells an epic tale of good versus evil with power, corruption, and balance at its center. At the heart of the story is the Mana Tree, the source of all life in the world, the Mana Seeds, the conduit for Mana, and Mana itself, the power which the Tree uses for all its creation. If the Seeds are unsealed and Mana power is unchecked and abused for evil purpose, it and the world are thrown out of balance. 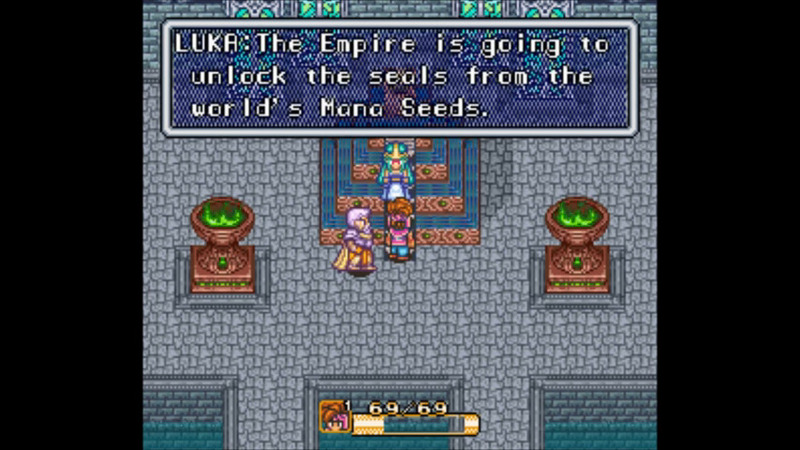 When this happens a hero will emerge, wielding the Sword of Mana, to put an end to the evil and restore balance by resealing the Seeds. The cyclical nature of history once again sees the need for a wielder of the Sword, as the evil King Vandole wishes to siphon the world’s Mana in order to raise the ultimate weapon, the Mana Fortress. Our hero, along with a heroine and a sprite (named Randi, Primm, and Popoi in the original Japanese manual), set off into the world to rally support, find and seal the eight Mana Seeds that can power the Sword, and put an end to Vandole’s tyrannical plot. Secret of Mana’s story is incredibly epic, as it takes us on this fantastical adventure full of action, heroism, desperation, and heartbreak. While there are global conflicts that consume our three heroes, there are also personal struggles, inner conflicts, and character growth that these three will experience. I’m truly impressed with how both the overarching plot and the character development undergo a transformation throughout the game. Both develop a depth that convey the gravity of the situation and seeing that impact of the unfolding events on both a worldwide scale, as well as a more focused level through the individual characters is wholly incredible. Its execution is equally impressive as the results of that depth create an amazingly immersive experience and draw out those emotions of fondness for the heroes, as well as sadness when tragedy strikes, or a sense of thrill and eagerness when a major showdown is about to occur. For the main plot, I like how complete it is, as it progressively becomes deeper and more immersive without leaving any major plot holes open. I also like the play on scale the story manages to incorporate. Sometimes a story event will result in the saving of an individual or two, while other times an entire city is freed from turmoil. That scaling really shows just how this threat can bear on any and all levels, from single persons to entire countries, and it gives the unfolding events a more authentic feel. I also appreciate the inner depth of the characters themselves. Randi start off as a troublemaker and unmotivated with his new quest, but as the game progresses, he matures and shows a deep affection for his friends. Primm demonstrates her inner strength with her unwavering resolve and determination to save Dyluck, while also remaining empathetic to her companions and the tasks at hand. Popoi’s lighthearted and mischievous nature lends himself as the source of humor throughout the game, usually pulling the other two into his bantering, but bringing out the good nature in all three of them. Altogether, they impart felicity, as well as genuine gratefulness for their friendship, and this unceasing dynamic emotionally draws you further into their endeavor. They become fiercely memorable and their lasting impact on us remains timeless. Seeing Randi’s progression from young kid to compassionate hero is worthwhile. Just as fantastic as the story is, so too is the gameplay. 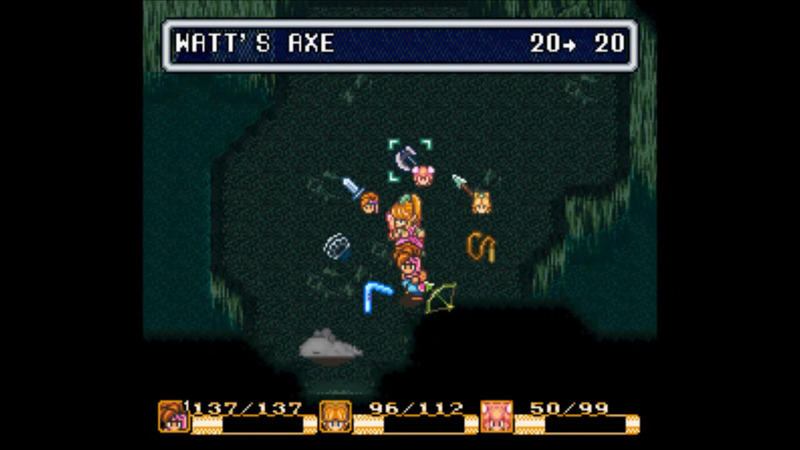 Secret of Mana features one of the most recognizable gameplay systems, with the utilization of RPG elements, real time combat, and its unique menu ring system. Starting with combat, the majority of the game sees our three heroes fighting against an assortment of enemies that require both physical and magical offensives. Physical attacks are varied by the collection of weapons made available throughout the campaign. From short range weapons like the sword and axe, to longer ranged weapons like the whip and bow, each type has its uses and there are enough to choose from for anyone’s preference. The one peculiarity to physically attacking is the recharge time. Once a swing or strike is initiated, a percent meter appears, indicating recharge. Only when the meter reaches 100% will an attack hit properly; anything before that will be weak or ineffective. As for magic, usage is broken into attack and support spells, with Popoi using attack and Primm using support. As elemental spirits are collected, new spells are learned and by using spells, just like using a weapon, they can be leveled up. Using a spell is as simple as opening that character’s menu ring, then selecting the element, spell, and target(s). Leveling up a weapon allows for powerful charged attacks and leveling up spells increases their effectiveness. 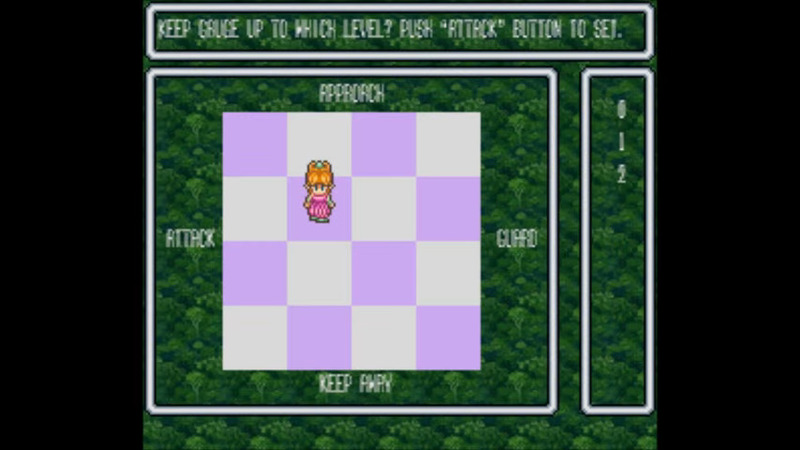 From casting spells and switching weapons, to equipping accessories and using items, the ease of Secret of Mana’s gameplay lies in the menu ring system. Each character has a menu ring button assigned to them and pulling up these rings allows players to do anything, from changing the way the two AI controlled heroes behave, to which enemy they should target, to using magic spells. Cycling through ring menus is easily done with the D-pad. It’s a tremendous degree of control and capability packed into a clean, simplistic form. Easy to use and master, the ring menu system quickens the rate of using items, casting spells, changing options, or exchanging gear at any time. Easily switching from a multitude of weapons keeps the gameplay engaging. In terms of its execution, the gameplay is especially strong. With the variety in dispatching enemies, along with the creativity that went into overworld and dungeon design, the game never gets dull or repetitive. The degree of difficulty is also satisfactory, as the challenge is both present, but never overbearing. While some players may not appreciate the recharge that comes with physical combat, it doesn’t detract from the pacing or fun of the game. It requires more thought, timing, and planning instead of randomly striking and, in turn, results in players developing their own tempo in combat, which I found to be quite immersive. Again, I also appreciate the ease of using the ring menus for magic casting, as it’s quick, simple, and easy to repeat when needed. Because of the overall simplicity, along with the variety and well executed implementation, the gameplay continues to be referenced and compared to for its remarkable quality. Change NPC behavior to fit your needs in combat. Speaking of quality, Secret of Mana is the game that first introduces, yet also perfects, the Mana style. The aesthetic beauty of this game is the gold standard and while the other Mana games have come close to reaching this level, none pull it off quite like Secret. Visually, the game is absolutely stunning, from the environments and backdrops, to the individual NPC and enemy sprite work. The SNES hardware was pushed to its limits and the results don’t disappoint. The visuals bring such a stark vividness to the world that few other games pull off and when added to the already stellar story and gameplay, it all comes together to produce a fantastically immersive experience. And if it couldn’t get any better, there’s the soundtrack. Simply put, the Secret of Mana soundtrack is one of the best ever. On its own the music is brilliant, as it wonderfully interprets the range of story and emotional tones in melodic form. But, its true splendor is unveiled when it’s paired with the events and actions on screen. I still get chills when I hear Whisper and Mantra start playing on my first visit to Luka in the Water Palace, and I get hyped every time I hear Mystic Invasion play as I enter a new dungeon. From the upbeat and jovial sounding The Color of the Summer Sky to the fast-paced, almost desperate melody of Leave Time for Love, each track fits its circumstance perfectly. And finally, I don’t have to complain about a lack of tracks, as I have in my previous reviews. Secret of Mana is a gem. It’s easily one of the best RPGs ever made and remains a timeless classic. We continue to draw comparisons back to Secret of Mana not only because it was the first time this style was implemented, but because the result is flawless. Simply put, this game is a masterpiece because it delivers perfection time and time again. It is the paramount example of the Mana style and why we covet anything closely resembling it. Other developers continue to strive to reach the same level of quality as this game, but few ever manage it. Secret of Mana is a game that will reveal something new every time you play it and will always succeed in delivering a sensational experience to the player. Rightly so, it will undoubtedly continue on as one of the greatest of all time.